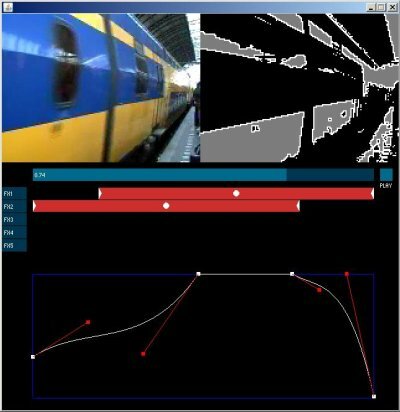 Realmatik is a little application written in Processing to demo real-time GPU video effects on video. Two iterations after the first version, and now it has the possibility of fading-in and out the effects by using bezier curves. When clicking on the slide bar representing the effect, a bezier curve editor appears in the bottom part of the screen. Selecting and dragging the control points of the curve allows to determine how the fade factor for the effect changes along the playback of the video. « GLTexture renamed to GLGraphics.